This week for In a Vase on Monday I am sharing a lovely gift. We visited our friends Christina and Gary’s garden to view the zinnias and share a delicious meal (and bring home a batch of homegrown tomatoes!!!). As a departing gift, Christina gave us this beautiful vase of zinnias from her garden. What could be more appropriate for our weekly vase than these beautiful summer flowers? Their zinnia bed is nothing short of spectacular; what a cutting garden. Please visit Cathy at Rambling in the Garden to see what she and others are sharing from their gardens this week. This entry was posted in Gardening, In a Vase on Monday, Uncategorized and tagged Rambling in the Garden, zinnias. Bookmark the permalink. Wow! Your friends must have a house full of flowers right now too! Lovely! They do indeed, Cathy. Thanks. I am a new convert to Zinnias and the more I see them the more I like them. As Cathy says your friends must have a house full of flowers all summer with a bed like that! Glad you liked them, Christina. Now that’s the way to grow zinnias! What fun it must be for your friends to go out and pick and choose. Thanks, Linda. My friends do indeed enjoy their zinnias. Thank you for this moment of beauty ! That is such a pleasurable view. How so very nice to look at something so beautifully tended. Thanks for your king comment. I see what you mean. They are such colorful flowers. What a beautiful and colorful bouquet. Great to spend time with friends and great gardeners. That is a fabulous zinnia bed. they just throw a bunch of seeds…a bit bunch…and you see what happens. 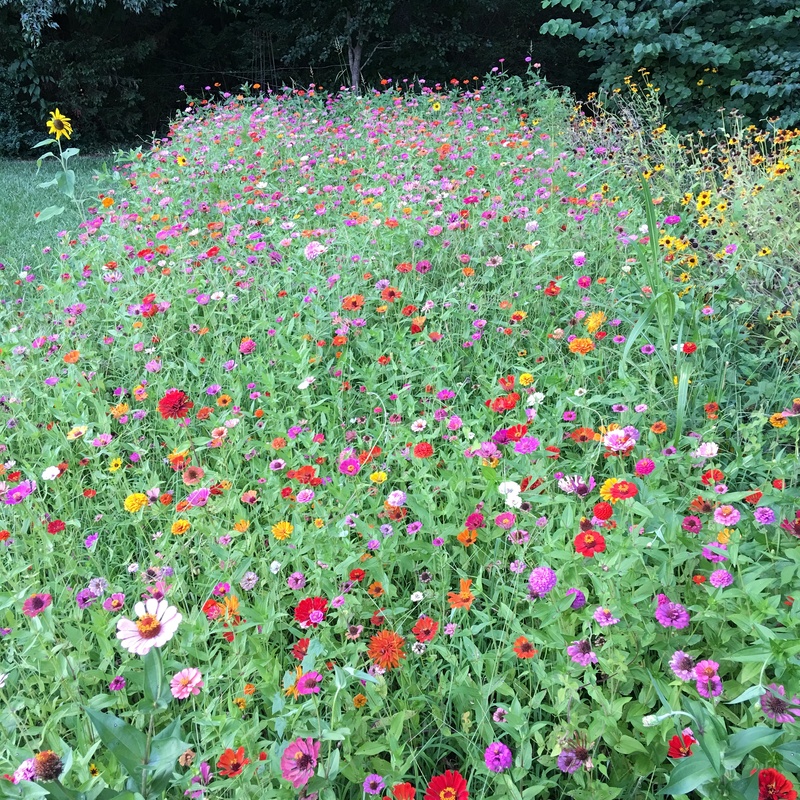 My friends do this every year…throw out a bunch of seeds and just see what happens. So, so colorful. They have a big bed to throw a bunch of seeds into though!